The closest major Airport is either Narita International Airport (NRT) or Haneda International Airport (HND). In both cases, please go to Tokyo station from the airport. Then you can get a direct bus in the direction of Fujinomiya from Tokyo station to reach to Konohana Family. Please refer to “The Access Narita”. The bus costs 1,000 JPY and takes about 100 minutes. Please refer to the airport limousine bus. The bus costs 930 JPY and takes about 40 minutes. When coming to Konohana Family, the highway bus is the most convenient option, since it requires no transfer. Our closest bus stop is Taisekiji Bus Stop; however, there are limited services that go that far. If your travel plan does not connect you to the limited buses that go to Taisekiji, you can take another bus that goes to Fujinomiya Station. 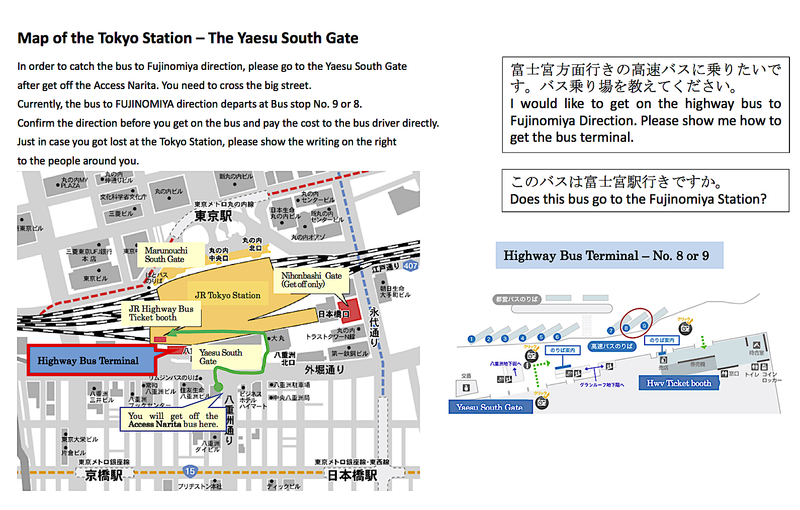 Highway Bus Terminal is located in Yaesu South Gate. Usually, the bus to Fujinomiya departs at the bus stop 8 or 9. *8:10 bus only runs on Monday, Tuesday, Saturday and Sunday to Taisekiji. On other days, you can get off at Fujinomiya Station. If you need assistance to book a ticket, please let us know in your visitor’s application form. We will help you. Please let us know your arrival time in advance so that we can pick you up by car at the bus stop. Pick-up cost is 594 JPY (one way) per person. You can also get access to Fujinomiya by train. The closest station is Nishi-Fujinomiya on JR Minobu-Line. Please refer to Hyperdia. This is the geographically the closest airport. However, there are limited services. If you come from this airport, please take a bus to either Shimada or Shizuoka train station. Please refer to this site for the airport bus information. You can check your train schedule with Hyperdia. Please let us know your arrival time in advance so that we can pick you up by car at the station. Pick-up cost is 594 JPY (one way) per person. The over-night-bus is the most reasonable option from Osaka/Kyoto. Please refer to Fujikyuko bus. If you need assistance booking a ticket, please let us know in your visitor’s application form. We will help you. And let us know your arrival time once you complete the reservation so that we can pick you up by car at the station. Pick-up cost is 594 JPY (one way) per person. If you take trains, you can check your train schedule with Hyperdia. There is no daytime bus from Osaka/ Kyoto.